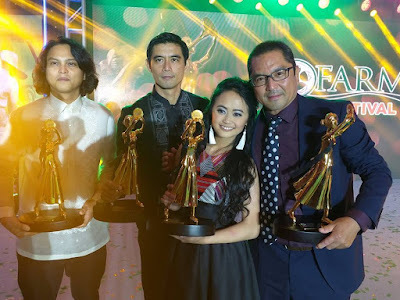 Tanabata's Wife won big at the 3rd TOFARM Film Festival Awards including Best Picture, Best Director (Charlson Ong, Lito Casaje and Choy Pangilinan), Best Actress (Mai Fanglayan) and Best Actor (Miyuki Kamimura), last September 15 held at Makati Shangri-La Hotel. Jury members for the full length competition were Manet A. Dayrit (chairperson), Jerrold Tarog, Sigrid Andrea P. Bernardo, Moira Lang, and Mel Chionglo. The short films' winners were chosen by Director Raymond Red and Cesar Hernando. Richard Quan finally bagged his second acting award in 25 years. His first acting recognition was from his first film, Saan Ka Man Naroroon, as New Actor of the Year from the PMPC Star Awards for Movies. Dulce serenaded actor Robert Arevalo, while Bituin Escalante sang a musical tribute for Director Maryo J. Delos Reyes, TOFARM Film Festival Director for 2006 & 2007. 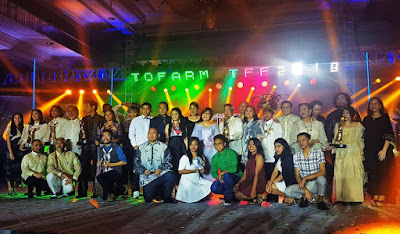 People’s Choice Award: Sol Searching directed by Roman Perez, Jr.
Tofarm Film Festival 2018 also honored Robert Arevalo for his memorable performances as a farmer in Sa Daigdig ng mga Api (1965), and Sakada (1976). Executive producer is Dr. Milagros How, festival director is Bibeth Orteza, managing director is Director Joey Romero. The film festival will run until September 18 (Tuesday) in Trinoma, Gateway, Greenbelt 1, SM Megamall, SM Manila, Robinsons Galleria, Gaisano Davao, and Ayala Legazpi.